All new for 2015, Jeep® is offering its first-ever small SUV in two models: 2015 Jeep Renegade Trailhawk and 2015 Jeep Renegade Latitude. Both models are excellent for multiple terrains, but the Trailhawk offers best-in-class 4X4 capabilities. The Selec-Terrain® system in the 2015 Jeep Renegade allows you to drive your vehicle in all conditions, including snow and rain. Although the Renegade looks like your standard Jeep SUV, it has a modified platform that it shares with the Fiat 500L. With a nine-speed automatic transmission, the 2015 Jeep Renegade delivers a best-in-class fuel economy taking you further for your dollar. In the United States, the 2015 Jeep Renegade will have two available powertrains: a turbocharged 1.4-liter, four-cylinder, 160-horsepower engine and a 2.4-liter, four-cylinder, 184-horsepower engine. There are also two available transmissions, which include a six-speed manual transmission for the turbo engine and a nine-speed automatic transmission for the other. Known as the Jeep Active Drive, the Jeep Renegade will also offer an available All-Wheel-Drive system, which makes towing easier and off-road driving more fun. In the Trailhawk model of the 2015 Jeep Renegade, there is a low mode in the Jeep Active Drive. This mode makes driving easier in heavier, more intense terrain. However, the Selec-Terrain® system further eases your drive by offering gears in four terrains: automatic, snow, sand, and mud with a fifth mode for rock in the Trailhawk model. Although it is 1.8 inches shorter than the Buick Encore, it is also 5 inches longer than the Honda Fit-an architecture that Jeep® is referring to as the new small-wide 4X4. The 2015 Jeep Renegade is chock full of power, technology, sporty décor, and a life of fun and adventure. 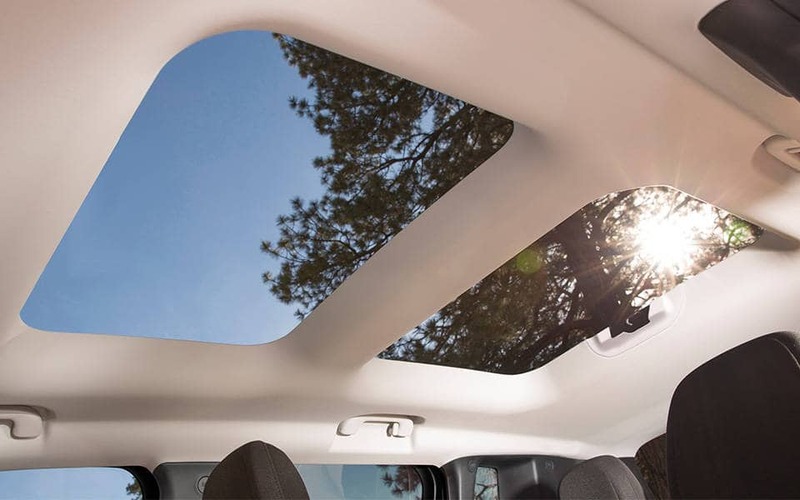 The My Sky open-air sunroom system lets you invite in the sunshine through dual roof panels that you can either manually remove or use a premium power tilt and slide feature. 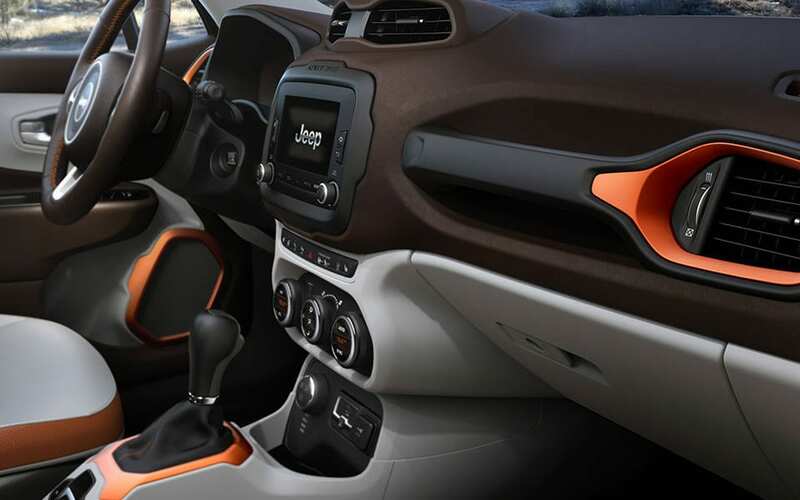 Both the interior and exterior of the 2015 Jeep Renegade are equally rugged, a design that Jeep® is calling "Tek-Tonic." These "Tek-Tonic" design features use structural elements, soft materials, various colors, and storage solutions so you can travel with your most extreme sporting equipment. You can also opt for a 5- or 6.5-inch Uconnect touchscreen system that offers various features including streaming music, connecting your phone to your Renegade via Bluetooth, a 9-1-1 emergency assist call, weather updates, sport updates, navigation, and more. There are more than 70 advanced safety and security features available through the 2015 Jeep Renegade. These features include hill descent control, Forward Collision Warning, ParkView® Rear Backup Camera, lane departure warning, blind spot warning, and rear cross-path detection. If you are in the market for a small, safe, and sturdy SUV, come on by Lynch Dodge Chrysler Jeep and test drive an all-new 2015 Jeep Renegade today.